, a statesman and historian, was descended from an honourable family in Scotland, and born at Halhill in Fifeshire, in 1530. At fourteen, he was sent by the queen regent of Scotland, to be page to her daughter | Mary, who was then married to the dauphin of France: but by her leave he entered into the service of the duke of Montmorenci, great constable and chief minister of France* who earnestly desired him of her majesty, having a high opinion of his promising talents. He was nine years employed by him, and had a pension settled on him by the king. Then, obtaining leave to travel, he went into Germany; where being detained by the elector palatine, he resided at his court three years, and was employed by him on several embassies. After this, prosecuting his intentions to travel, he visited Venice, Rome, and the most famous cities of Italy, and returned through Switzerland to the elector’s court; where, finding a summons from queen Mary, who had taken possession of the crown of Scotland, after the death of her husband Francis II. he set out to attend her. The queen-mother of France at the same time offered him a large pension to reside at her court; for she found it her interest, at that juncture, to keep up a good understanding with the protestant princes of Germany; and she knew sir James Melvil to be the properest person to negociate her affairs, being most acceptable to them all; but this he declined. Upon his arrival in Scotland, in 1561, he was admitted a, privy-counsellor and gentleman of queen Mary’s bedchamber; and was employed by her majesty in her most important concerns, till her unhappy confinement at Lochleven; all which he discharged with an exact fidelity; and from his own account there is reason to think that, had she taken his advice, many of her misfortunes might have been avoided. 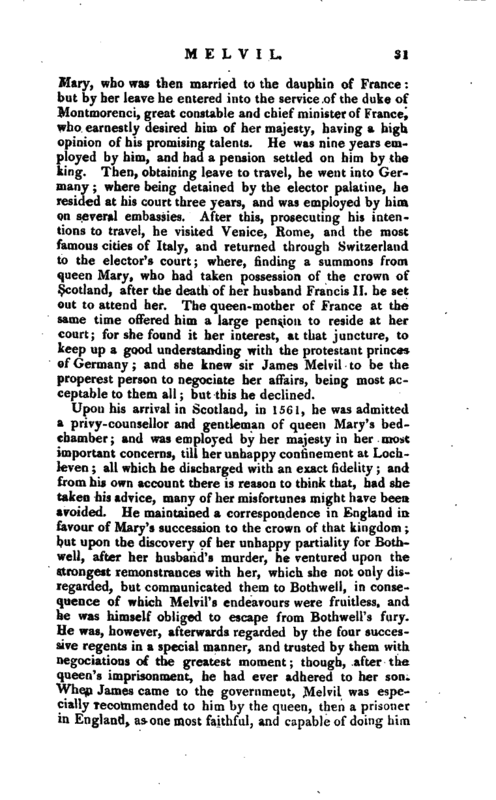 He maintained a correspondence in England in favour of Mary’s succession to the crown of that kingdom; but upon the discovery of her unhappy partiality for Bothwell, after her husband’s murder, he ventured upon the strongest remonstrances with her, which she not only disregarded, but communicated them to Both well, in consequence of which Melvil’s endeavours were fruitless, and he was himself obliged to escape from Bothwell’s fury. He was, however, afterwards regarded by the four successive regents in a special manner, and trusted by them with negociations of the greatest moment; though, after the queen’s imprisonment, he had ever adhered to her son. When James came to the government, Melvil was especially recommended to him by the queen, then a prisoner in England, as one most faithful, and capable of doing him | service: and was made by his majesty a member cf his privy council, of his exchequer, and a gentleman of his chamber. He always continued in favour and employment; and the king would gladly have taken him into England, at the death of Elizabeth, promising him considerable promotion: but sir James, now advanced in years, and desirous of retirement from business, begged his majesty to excuse him. He thought it right, however, to pay his duty to his majesty, and accordingly went to England: and then returning to his own house, he died soon after, in 1606. 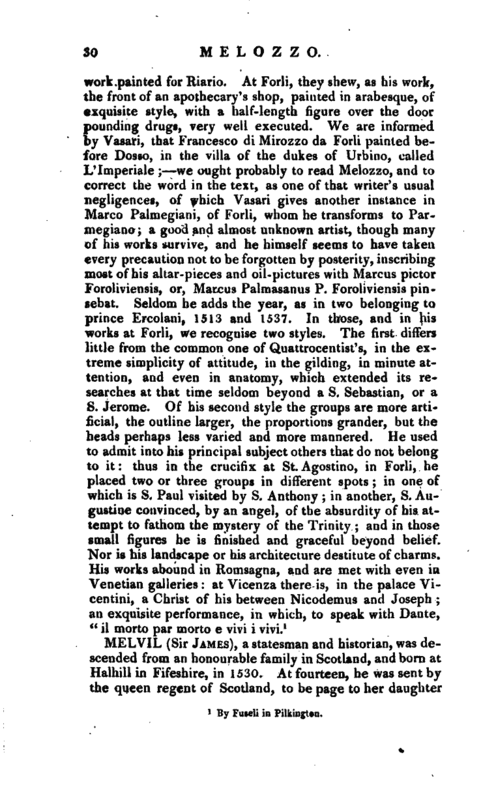 Preface and Memoirs. Robertson’s Hist, of Scotland. 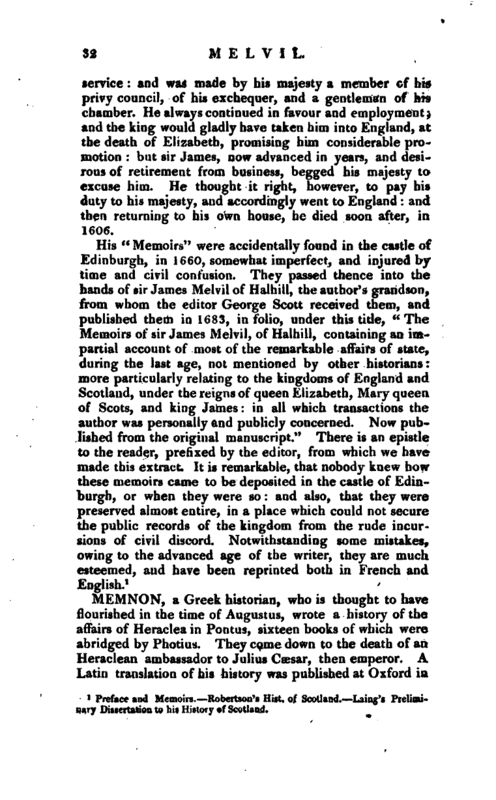 Laing’s Preliminary Dissertation to his History of Scotland.